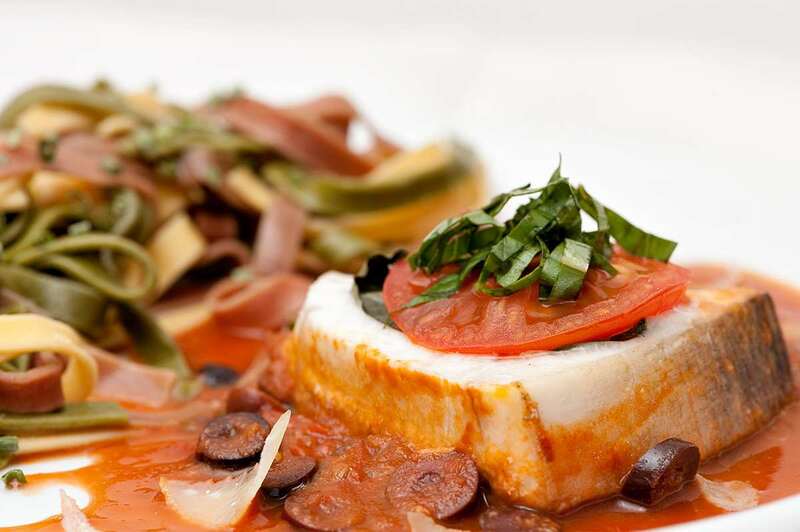 Swordfish steaks, cooked in a tomato sauce with Kalamata olives and fresh basil. Covered with basil leaves and tomato slices, the fish steaks are gently cooked in the oven so that they keep moist. Set heavy ovenproof pan over medium heat. Add olive oil, salt and onions. Cook until the onions are soft and translucent. Add garlic. Reduce heat and cook for another 2-3 minutes. Do not brown. Add chopped tomatoes. Cook for about 10 minutes. Add red wine, tomato juice and cayenne pepper. Cook for 2-3 minutes. Blend with a stick blender until smooth. Add sliced olives and shredded basil. Adjust seasoning with salt. Place swordfish steaks in the sauce. Top each steak with a basil leaf and a tomato slice. Cook in oven until the fish is done - about 10-15 minutes. Don't overcook. Remove from oven and serve: Spoon some sauce on a plate. Add the fish. Top with shredded fresh basil and add some shaved Parmesan cheese. This was really delicious, thanks for sharing!